Russia Says It Will Build New Missile Systems Within 2 Years The U.S. said last week it would stop abiding by the Cold War treaty banning intermediate-range nuclear missiles. "Our response will be symmetrical," Russian President Vladimir Putin said. 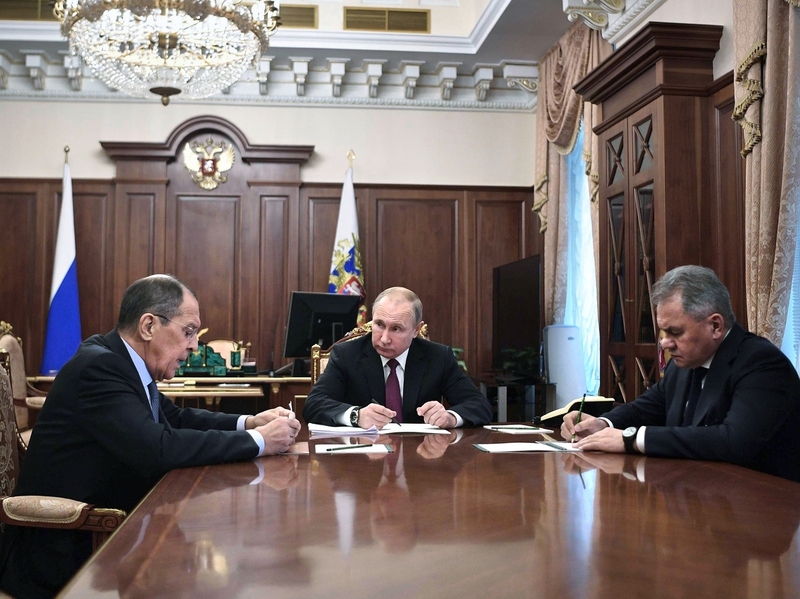 Russian President Vladimir Putin (center) attends a meeting with Russian Foreign Minister Sergey Lavrov (left) and Defense Minister Sergei Shoigu in the Kremlin in Moscow on Saturday. Putin said Russia would abandon the 1987 Intermediate-Range Nuclear Forces treaty, calling it a "symmetrical" response to the U.S. decision to withdraw. The U.S. said last week that because of Russian violations, it would no longer abide by the 1987 Intermediate-Range Nuclear Forces treaty, which required the destruction of ground-launched ballistic and cruise missiles with a range of 500-5,500 kilometers (310-3,410 miles). Putin responded by suspending Russia's observation of the treaty, claiming the U.S. had violated the agreement long ago. "Our response will be symmetrical," Putin said, as reported by NPR's Moscow Correspondent Lucian Kim. "If our American partners suspend their participation in the INF treaty, so will we. And if they start working on new weapons, so will we." Russian Defense Minister Sergei Shoigu said he wants work to begin on long-range hypersonic missiles that travel at least five times the speed of sound, The Associated Press reported. He said the new hypersonic missile should be ready by 2021. Shoigu also called for new land-based launch systems for an existing cruise missile, the Kalibr, which currently can be launched only via ships. Shoigu told a meeting of defense chiefs that the U.S. was "actively working to create a land-based missile" with a range of more than 500 kilometers, which is forbidden by the INF treaty. "President Putin has given the defense ministry the task of taking symmetrical measures," he said, according to Reuters. Shoigu was passing on the order that Putin gave him during a meeting Saturday, which also included Foreign Minister Sergey Lavrov. NPR's Kim said the Kremlin meeting was "staged for TV." As reported by the Kremlin's official English site, Lavrov told Putin that the U.S. has been violating the INF treaty since 1999, "when it started testing combat unmanned aerial vehicles that have the same characteristics as land-based cruise missiles banned by the Treaty." U.S. deployment of vertical launching systems in 2014 is an "outright violation of the Treaty," Putin agreed. During the meeting, Putin emphasized that any new weapons wouldn't be deployed unless the U.S. deploys weapons first.